A Theology of the Christian Bible: Revelation – Inspiration – Canon est le grand livre que vous voulez. Ce beau livre est créé par Denis Farkasfalvy. En fait, le livre a 272 pages. 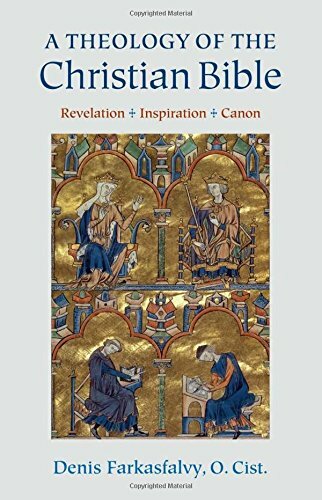 The A Theology of the Christian Bible: Revelation – Inspiration – Canon est libéré par la fabrication de The Catholic University of America Press. Vous pouvez consulter en ligne avec A Theology of the Christian Bible: Revelation – Inspiration – Canon étape facile. Toutefois, si vous désirez garder pour ordinateur portable, vous pouvez A Theology of the Christian Bible: Revelation – Inspiration – Canon sauver maintenant. A Theology of the Christian Bible is built upon the thesis that divine revelation, the inspiration and canonization of Scripture should be viewed as "sequentially linked movements" of a single process wherein God reveals his Word in history and ensures permanent accessibility of revelation for his People, both of Israel and of the Church. The starting point is the view expressed in the Second Vatican Council's document Dei Verbum that revelation consists of the "words and realities" of Salvation History. This marks a shift away from the neo-scholastic concept that approached revelation primarily as a set of propositional truths. Farkasfalvy begins with the notion of revelation as a historical process: God reveals his Word in a "salvation history," which culminates in the Incarnation. The transmission of revelation always involves human mediation by chosen individuals or, in the language of the biblical and patristic tradition, "Prophets and Apostles." Farkasfalvy then moves on to review some of the major contributors to the theology of inspiration around the time of Vatican II (Bea, Rahner, Alonso-Schökel), the teaching of Dei Verbum proper, and finally the 2014 document of the Pontifical Biblical Commission and biblical inspiration and the truth of the Bible, treating each of these in its individual context. According to Farkasfalvy, the theology of inspiration was greatly handicapped by the neo-scholastic notion of God as a "literary author" of the scriptural texts. Advocating God as true and genuine "author" of Scripture, but in a non-literary sense, Farkasfalvy also reviews afresh the tradition inspiration-incarnation analogy. Scripture should be thought of in light of God progressively revealing himself in limited and located contexts to chosen human beings, through whom revelation is transmitted in verbal and, eventually, written form. God guides the complex compositional processes of the biblical books so that his word becomes accessibly and permanently preserved in writing for his people, the Church. The final chapters of A Theology of the Christian Bible take up the extension of these dynamics into canonization. These largely exegetical and historical chapters focus on the transmission of the revelation in Christ through both Testaments by means of Jesus' Apostles, embracing the Hebrew Scriptures and setting in motion the formation and, in early patristics, the canonization of the New Testament.